Like Miles Davis, Nina Simone was renowned for her uncompromising stage presence. As Live at Montreux 1976 documents, Simone knew what she wanted, and was not reluctant to let stage-hands or audience members have it, if they weren’t with the program. The 1976 concert is a representatively classic Simone set. Tunes like Langston Hughes’ “Backlash Blues” and “I Wish I Knew How It Would Feel to Be Free” are the kind of political statements (or tunes refashioned into political statements) that formed a significant portion of her repertoire. Nina Simone was another multi-hyphen jazz artist whose work crossed over into soul, folk, and pop. A tune like “Be My Husband” performed sans piano over her drummer’s rhythm exemplifies that genre defiance. Montreux also captures Simone as a stern stage-manager. At one point she literally scares a soundman off the stage, when he has trouble adjusting her microphone. Towards the end of the show she breaks off from her encore of Laura Nyro’s “Stars” instructing a woman in the back of the hall: “Hey girl, sit down.” Watching Nina Simone at Montreux is always fascinating, although it gets a little uncomfortable at times, as when she keeps asking if David Bowie is in the audience. It is the full Nina Simone experience. Montreux 1976 is nicely expanded with cuts from Simone at Montreux sets in 1987 and 1990. 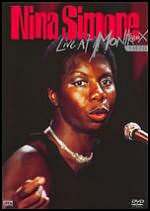 Amongst the “bonus” cuts are some songs most associated with her, including “My Baby Just Cares for Me,” “I Loves You Porgy,” and “Ne Me Quitte Pas.” Simone’s Montreux performances also serve as reminder of her skills on the piano, which are often overlooked. Simone was originally trained as a classical pianist, and that background is clear on her intro to “Little Girl Blues” and in her recasting of “My Baby” from her original recording which then enjoyed renewed popularity from its use in a Chanel commercial. The cuts from 1987 and 1990 largely omit any talk between songs from Simone. However, we do see her forcefulness as she directs the audience in the proper way to sing the chorus to “Liberian Calypso.” It is clear Simone knew what she wanted from audience and musicians alike, and got it. Nina Simone was a unique artist, well captured in these Montreux sets. Few artists had the command (literally) of an audience as she did. It’s quite a show to watch.